The most daring denim company in the world, Naked and Famous, is back at it again. 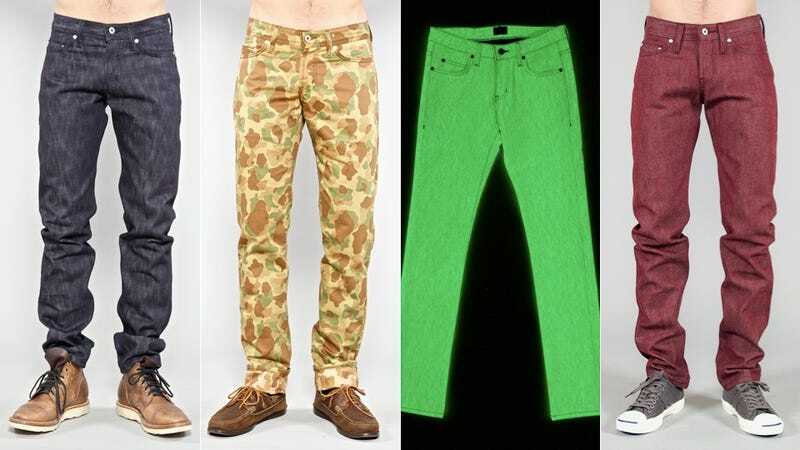 Not satisfied with just making jeans glow in the dark or scratch-n-sniff> or pans that feel like silk and hemp and gauze, Naked and Famous is making jeans with camo, jeans that marbleize, corduroys that act like denim, more glow in the dark gear and other wacky denim. The 18oz selvedge denim is purposefully bumpy and irregularly textured because the machine that stitches em together is put at a lower setting "to create more loom chatter". When the jeans fade, it actually turns into something from the 80's. The yarn in these selvedge jeans are actually core dyed beige and then rope-dyed indigo so after time when the jeans are worn longer, the fade looks more beige, hence more dirty looking. Now this is pretty neat, the pants are corduroys but they fade like regular jeans because of the indigo. Cords that wear like jeans!